With smartwatches taking the market by storm, it looks like traditional watch makers have no choice but to hop onto the bandwagon too. 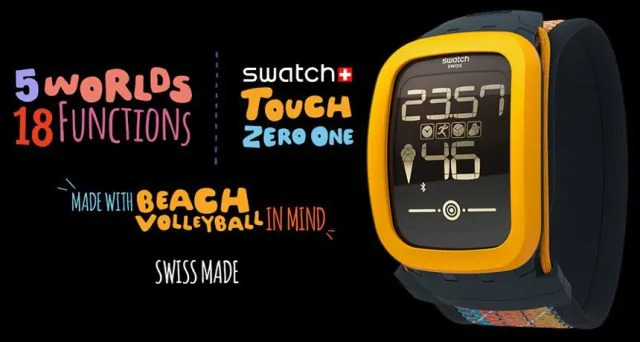 Swatch just announced its first smartwatch called the Swatch Touch Zero One, that is “a new generation of Swatch”, and strangely enough, is made for Beach Volleyball players. The Swatch Touch Zero One is equipped with sensors that can track a volleyball player’s activities including attack hits, low hits, high hits and high fives. It can keep track of the steps taken, and then calculates the distance travelled during the game. The wearer can then review back his/her activity via an accompanying smartphone app, and even receive a score based on the previous game. The app can keep track of the scores, and show you your progress over a period of time. However, while the Touch Zero One may look like a smartwatch with a large display, a sensor to keep track of physical activities and has an app for it, it most probably isn’t a smartwatch you’ve been looking for. The watch is designed specially for beach volleyball players only, and can’t display emails, message notifications, and doesn’t even allow you to control your phone with it. The watch is based on Swatch Touch, which features a curved touch display, a backlight and six timing functions. Swatch did not mention the battery capacity, but says that it will be able to last for months on a single charge. The Swatch Touch Zero One is scheduled to be released later this year for US$160 – that’s about RM580. Any beach volleyball players here? Will you be interested in a smart wearable that can keep track of your performance in a game?